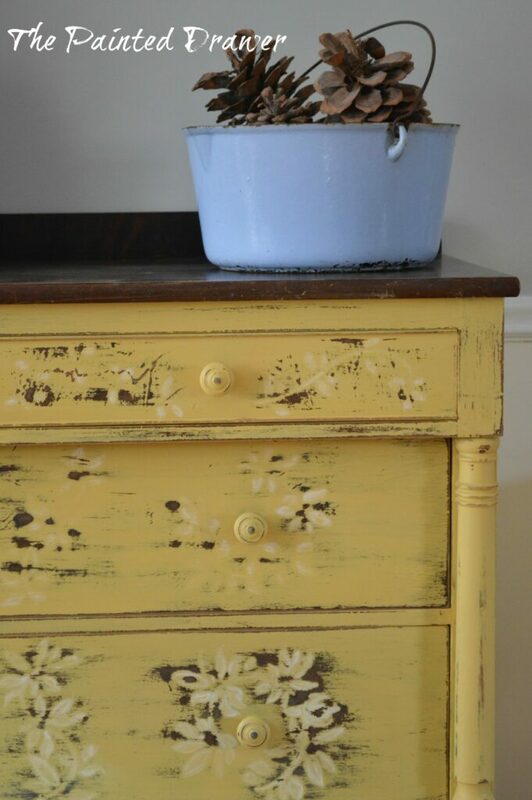 In the spirit of yesterday’s post on a pop of mustard for fall, I am sharing last year’s Chippy Daisy Dresser Before and After. 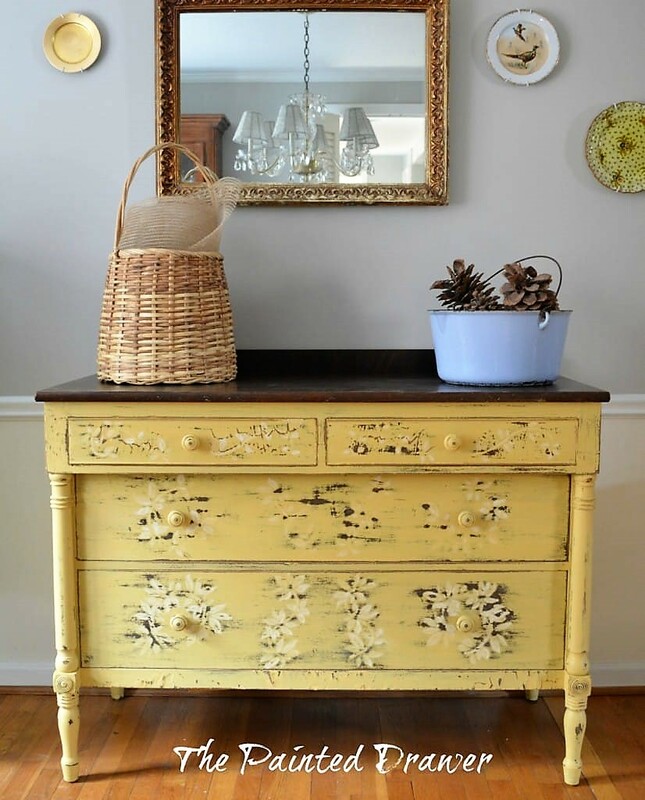 The dresser sold at last year’s Luckett’s Spring Market and is still one of my faves! 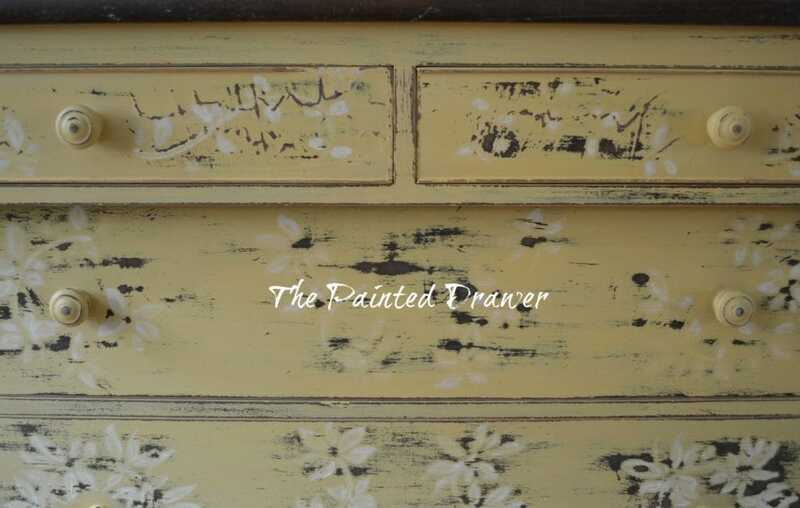 I have been working for the past few days on this vintage dresser than I refinished in General Finishes Milk Paint. The color is Somerset Gold and is a gorgeous, deep mustard color. It looks amazing with a dark wooden top and lends itself to the farmhouse aesthetic. I thought to try a new approach on this piece. I love to paint and draw and decided to try out my talent on the drawers. I first used chalk to outline the design and then acrylic paint to color it in. Then came the fun part! I just love the look of old, chippy painted pieces. General Finishes does not naturally chip off so I went to town with my sand paper to create the look. It was a lot of fun to heavily distress the piece back. The idea of rubbing off most of my hard work was daunting at first but once I got started I had a ball. Here it is all done and ready to share! It’s waiting patiently for the Luckett’s Spring Market!! so pretty! i love that color- one of my favorites was in that color! FABULOUS!!!! 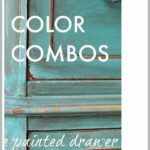 Love the color and your creative re-do! 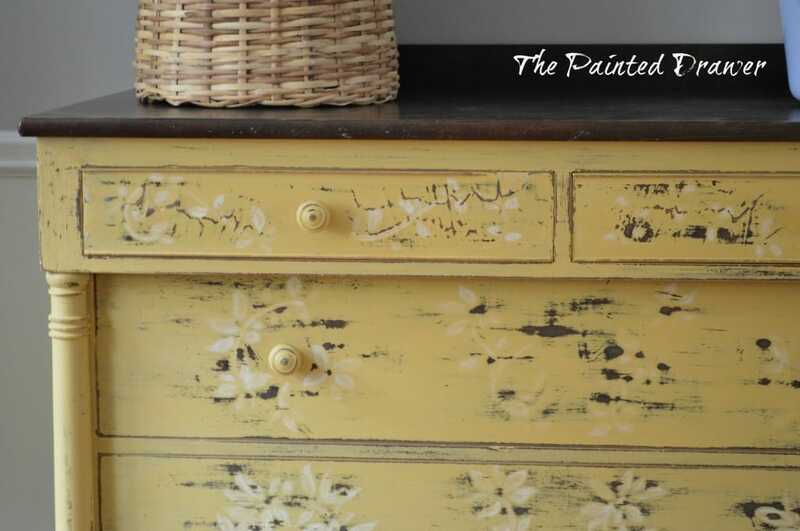 Absolutely wonderful job…I look at hand-painted furniture daily on many blogs…most are very, very nicely done…but the addition of your painted flowers makes yours unique…I truly love your finished piece. 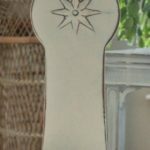 Your expert sanding gives it the perfect “antiquey” touch! Thank you so much for the compliment. It really means so much to me! 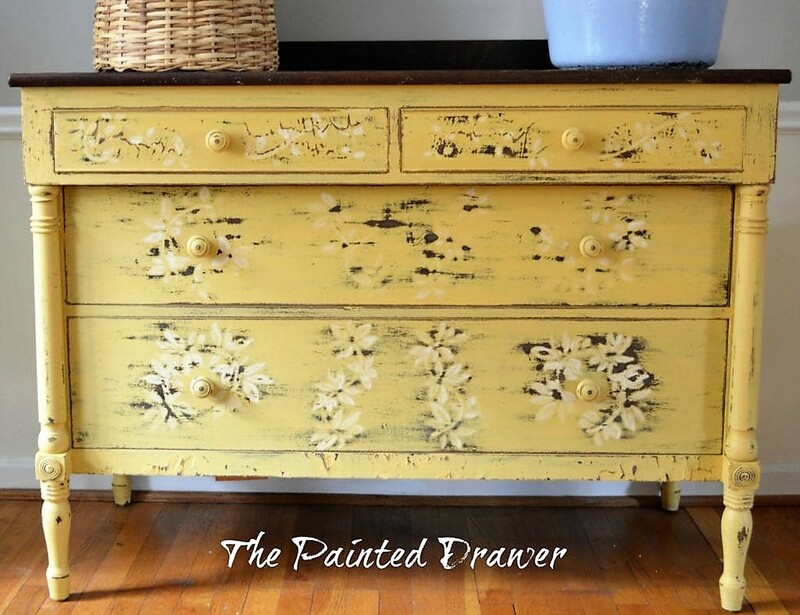 Suzanne, your mustard dresser is stunning! Beautiful handpainted detail and nicely done distressing. It caught my eye over at the Nifty Thrifty Tuesday party. This is absolute perfection !!! 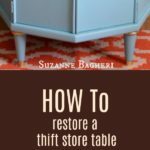 Visiting from WOW Us Wednesday — very pretty dresser. 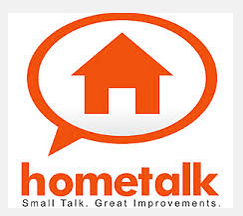 I was looking through your site — don’t think I ever heard of this brand of paint. It is appealing to me because you say it does not chip which is what I prefer. I am going to look at some of your other work — I like what I see! You said you used acrylic to paint your flowers. Did you have any trouble with it balling up while sanding like latex does, or did it sand off nicely like chalky paints do? I really like the effect. Should we be seeing more, completely unique pieces out of your creativity!? There are 10 gudzillion French Linen, Old White, and Duck Egg Blue. Been there, not my colors to start with! This yellow and your treatment are refreshing! Hi Christine, I didn’t have any trouble with the acrylic paint. 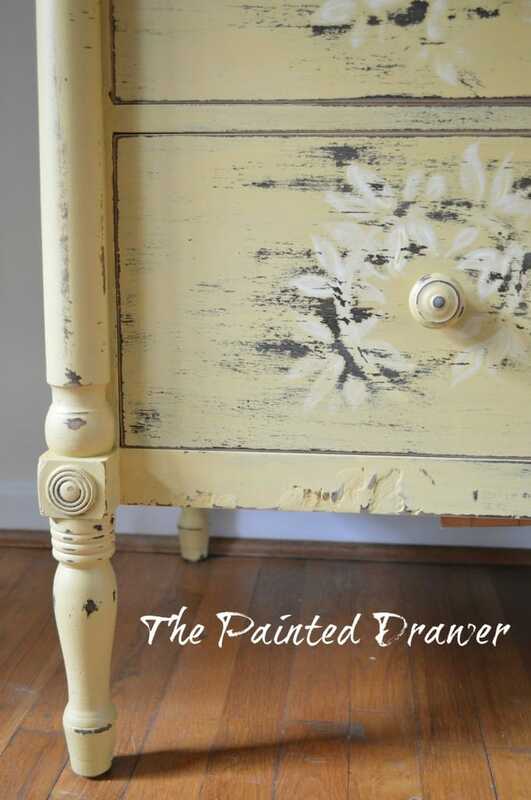 It sands off very well and is better than chalk paint which may sand off too much. I was able to control how much I wanted to show. Thanks so much for your comment! I really appreciate it and yes, I hope to be doing more original work. I find that I get bored with the same old techniques and have to change it up as I go or it just won’t be fun anymore! Oh I do love this piece. Gorgeous and I love the color and flowers. Very well done. Hugs, Marty P. S. I would love for you to link up to my ongoing Inspire Me party at http://www.astrollthrulife.net. I love this! Mustard is one of my favorite colors and this is so completely stunning. Just found you from Wow Us Wednesday! What a stunning piece! I love the color and all of the hand painted detail. Pinned 🙂 Thanks for sharing at The Makers! 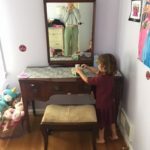 Love your dresser! That yellow color just looks so refreshing! Love the painted design as well! 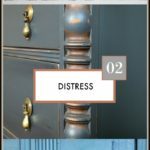 Absolutely amazing dresser , I am in love with it! Well done to you, great work. What a great piece – gorgeous color and the flowers are such a special touch! This is absolutely stunning! Well done! I love that the daisies are distressed as well and the fact that the whole thing doesn’t appear “deliberate”. Looooove it! 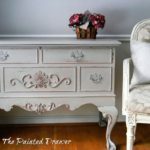 I love this dresser and am pinning! Although pretty, painted decorations, etc on dressers usually don’t wow me. 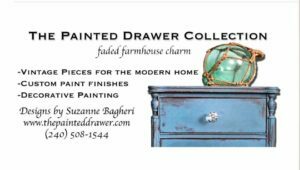 The painting you did on this one is so nice and muted – it’s perfect! 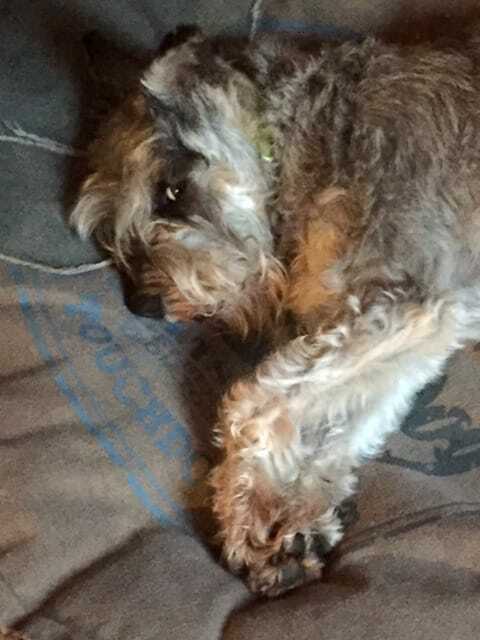 So sorry to hear about your foot – and Lucky’s too. Take care and mend feet mend! The dresser is so lovely. You and Lucky get better soon. So sorry you hurt your foot, The dresser is beautiful…. I hope you and Lucky both get well soon! Beautiful dresser; love the look. 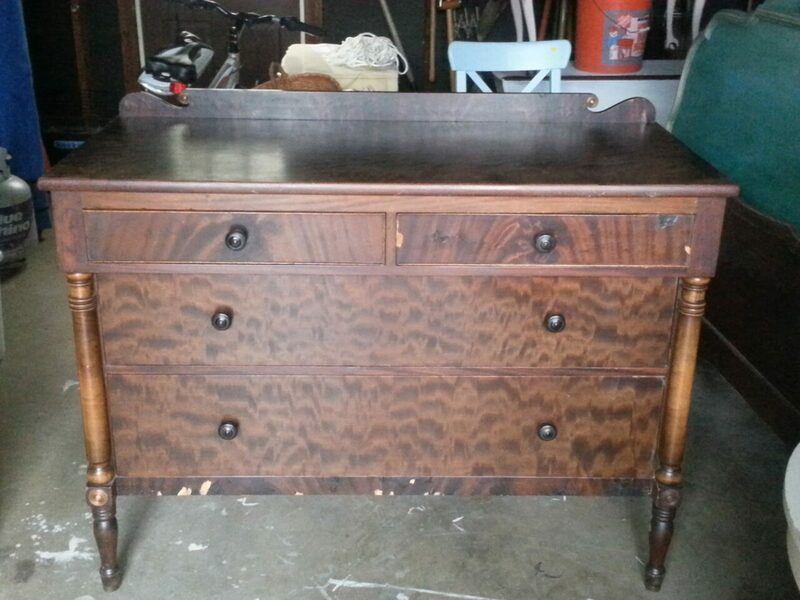 Oh my goodness…I love, love, love this dresser!!!!! The color and flower design are beautiful!!! Did I mention that I love this piece? 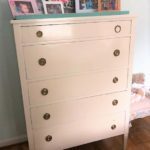 I remember this dresser – it’s stunning! 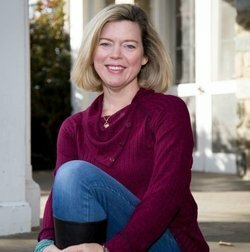 I hope you’re on the mend soon Suzanne, sorry to hear about your foot. love it !!!! get well soon you and lucky !! !